WOW! Welcome to GOY Randallsd :)))) Just read the story on this plant, seems like you are very lucky to have one. WOW, is right Michaella. I just had a look as well....this is a very lucky plant thanks to Dennis Breedlove!!! All but extinct in the wild. You are so lucky to have one, and to have the climate to make the best of it too! Great pic! Wonderful story to it, too! I am supposing that it got its name after the 19thC german naturalist, Ferdinand Deppe, who explored Mexico. Oxalis deppei, commonly known as "Iron cross", is named after hm, also. Glad you posted your Deppea...as they always look great!!! I too am thankful to Dennis Breedlove for rescuing this plant. Though it is now presumed to be extinct in the wild, I hope someday it can be returned to its native home in the mountain cloud forests of Chiapas, Mexico. Hi Delonix1, just noticed you here when you were posting some of your pictures yesterday. Lots of great shots! I've been exploring the website, much to see here. Will post more pictures soon. I think you're going to really enjoy GoY! Look forward to seeing your Wodyetia bifurcata - Foxtail Palm posted. I think in some of my photos I can see your Foxtail palm in the background from my front yard. 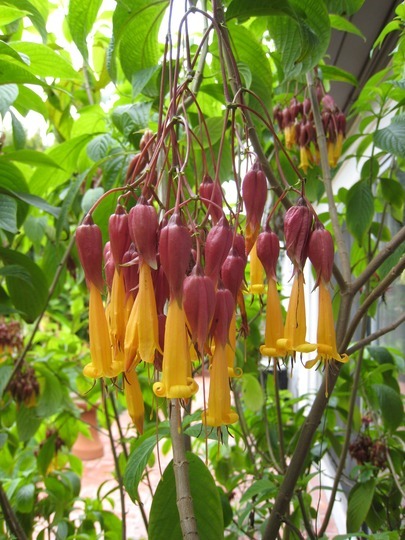 This photo is of species Deppea splendens.